I have enclosed some photos of a drum that was given to me by my grandfather. 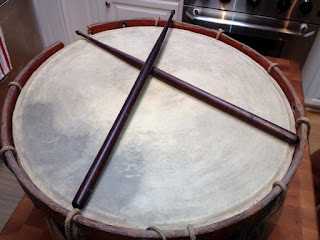 I have no idea the age of the drum and that is why I have contacted you. I have always been curious of its history. 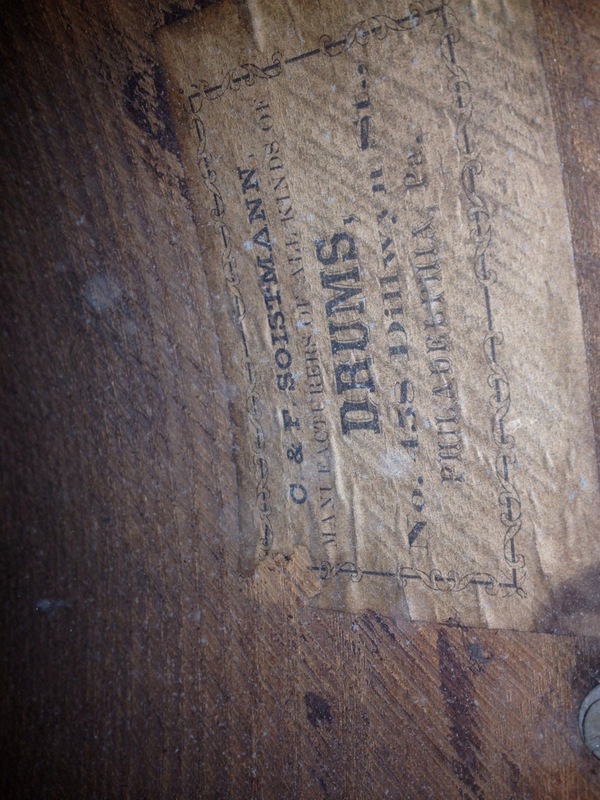 The paper tag inside the drum states that it was made in 458 Dillwyn St. Philadelphia, Pa. by C & F Soistmann. 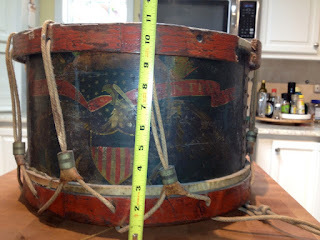 I know my family is from there and were original settlers in the U.S.
John C. Haynes Bass Drum Converted from Rope to Rod? 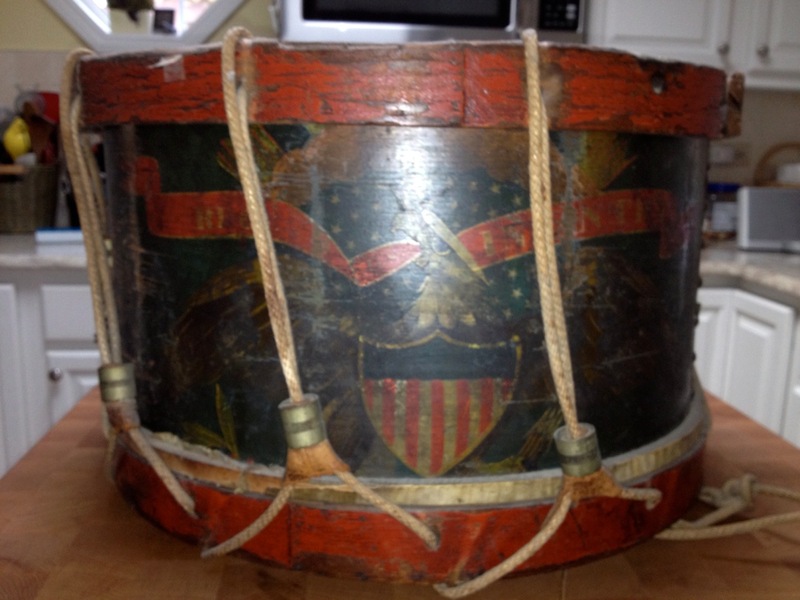 I'm trying to find info on a bass drum that I have that has a label inside that says John C. Haynes. I was told this was originally a rope drum that was converted to rod. Any info you have would be appreciated. 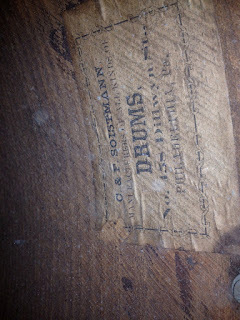 It's clearly a Haynes drum judging from the labels. The hoops might be original (leading to the conclusion that the drum was originally rope-tensioned) or replacement from a rope-tensioned bass drum of the same size. 2. A shell that shows rod fulcrums or guideposts along the center. This is a tough one. Was it originally a rope drum? 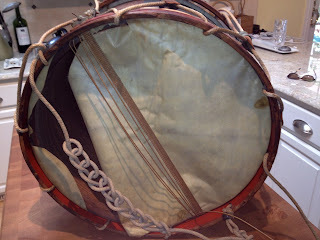 The counterhoops were definitely originally from a rope drum. 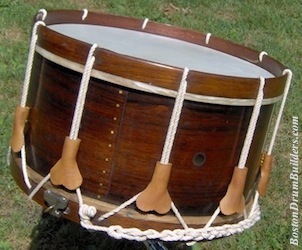 But was it the same drum as this? I don't know. Here's a guess. The drum was converted. That guess is based on the drilled hole in photo PA250056 above the guidepost. That looks like it could have been a mistake. Factories wouldn't make that kind of mistake but an aftermarket modifier might. Also, from the same photo, the screws for the leather handles don't seem to line up perfectly. The original drum maker would have made sure that they did, but an aftermarket modifier might not have been as careful. And, in photo PA250063 one can see evidence more abandoned holes (2) (and another abandoned hole in PA250061) which appear to have been mistakenly drilled into the drum and then abandoned in favor of a new set of holes for the guidposts that were actually used. That tells me that this is was a rope drum that was modified to be a rod-tensioned drum. Also, more information about Haynes is below. Thanks for writing. Interesting stuff. See http://www.fielddrums.com/1863Haynes.pdf for information about Jack Lawton who restored a Civil War era Haynes drum that I own. 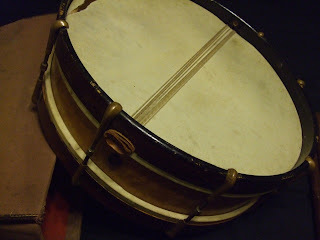 Also, see http://blog.fielddrums.com/search?q=haynes for articles I've posted about Haynes drums. 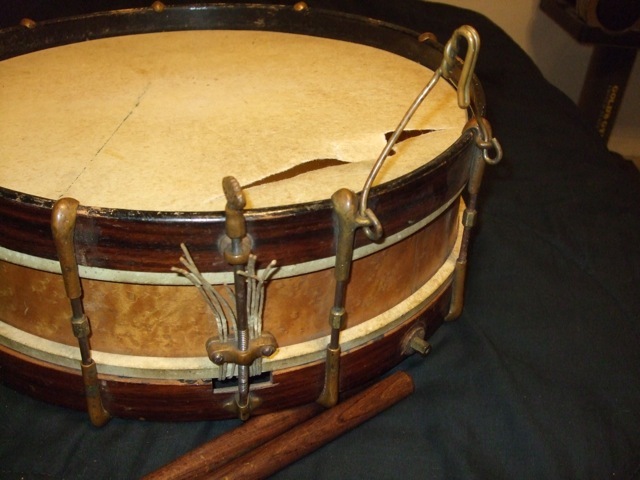 Haynes supplied drums to Civil War regiments from 1863 to 1865. 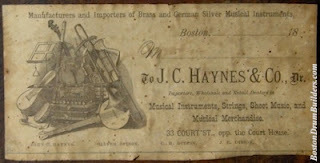 Lee Vinson wrote: John C. Haynes became involved with Oliver Ditson as early as 1852 and by 1861 was manager of J. C. Haynes & Company, Oliver Ditson & Company's Boston based musical merchandise department. 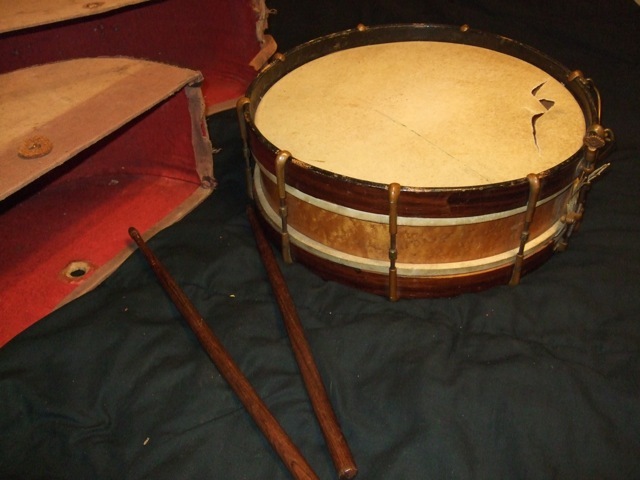 It is a common misunderstanding that the Haynes company only produced drums during the Civil War. Haynes continued to operate for Ditson under the J. C. Haynes & Co name at the 33 Court Street address until 1889 when the retail business moved to Washington Street. The building at 33 Court was razed in 1898 and the Haynes department was finally absorbed under the Ditson name in 1903. Haynes passed away in 1907. The John C. Haynes Company was the musical instrument manufacturing division of the Oliver Ditson Company for the entirety of the Haynes Company's existence from 1861 through the end of 1903. So rather than being a truly independent company, John C. Haynes was essentially a brand name within the greater whole of Oliver Ditson & Company, later the Oliver Ditson Company. John C. Haynes first became employed by Boston music publisher and retailer Oliver Ditson in 1848 and by 1857 had risen to the level of partner with the firm which was then renamed Oliver Ditson & Company. Upon Oliver Ditson's death in 1888, Haynes would become president of the corporation which was then incorporated as the Oliver Ditson Company. 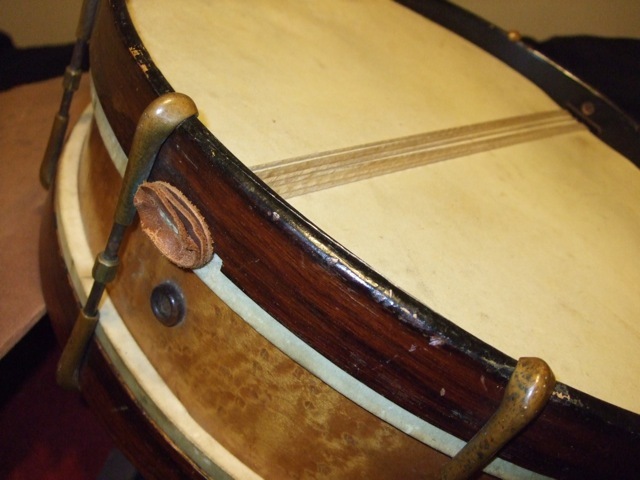 In 1861 the firm of Oliver Ditson & Co. bought a bankrupt stock of musical instruments. There was no room in the Ditson store to accommodate this large stock, the purchase of which marked a new departure for the firm. A store was therefore rented, and, as it was thought unwise to have two stores in the same city under the name "Oliver Ditson & Co.," the new store designated "John C. Haynes & Co.," Mr. Haynes at that time being Mr. Ditson's only partner. The musical instrument branch has continued ever since as John C. Haynes & Co., but it has always been a department of the Ditson house. We shall remove January 1 , 1904, to our new building, 150 Tremont street, with ample space for all departments under one roof. The reason, therefore, for having a separate name for the musical instrument branch no longer exists, and from that date John C . Haynes & Co. will become Department B of Oliver Ditson Company, with Mr. Charles Bobzin, for many years with Lyon & Healy, of Chicago, as manager. THE GREAT MUSICAL INSTRUMENT DEPARTMENT OF THE OLIVER DITSON CO., BOSTON, MASS. Much has been printed in many parts of the United States concerning the elegant quarters fitted, and now occupied, by the world's greatest music publishing house, the Oliver Ditson Company, Boston, New York, and Philadelphia, and but little concerning the musical instrument house of John C. Hayes & Co., which, it is well understood, is the musical instrument department of this great publishing house, remarks a writer in the Boston Budget. A short description of the stores and the business of John C. Haynes & Co. will be of interest. No. 33 Court street, Boston, where the business was established thirty years ago, is still the leading retail musical instrument emporium in America. Business at this old stand has increased steadily, until May, 1889, the firm was obliged to lease the large store No. 694 to 700 Washington street, transferring their wholesale business principally to that store. A large stock of banjo and guitar music from all publishers, as well as piano music and books, are special features at No. 33 also. Customers will find a competent and obliging corps of salesmen in attendance. John C. Haynes & Co. have recently removed from No. 694 to 700 Washington street to their newly fitted apartments at No. 453 to 463 Washington street. Customers enter at No. 463, taking the elevator to the third floor, which is richly fitted with show cases filled with desirable instruments for musicians. The next floor is used for storing and shipping. Three large floors in the building No. 453, which are connected with these rooms, are used for laying out dealers' orders, drums, band instrument and repairing departments. Their manufactory, where the "William B. Tilton" and "Haynes, Excelsior" guitars, and "Bay State" guitars, mandolins and banjos are made is located on Stanhope street. Messrs. C. H. Ditson & Co. of New York and Messrs. J. E. Ditson & Co. of Philadelphia draw their musical instrument supplies from John C. Haynes & Co. These houses have largely increased their facilities in this department recently. At the time of its razing in 1898, the building occupied by John C. Haynes & Company at 33 Court Street (pictured at right) was purported to be the 'Oldest Music House in America' having been previously occupied by Elias Howe whose remaining stock was purchased by Ditson in 1861. 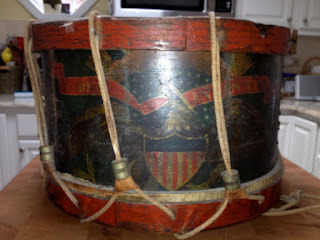 It is a common misconception that any J. C. Haynes drum with a label bearing the address of 33 Court Street dates to the Civil War. While the company was indeed located at this address as far back as the Civil War era, Haynes continued to do business at 33 Court Street decades later even after their newer manufacturing facilities had opened at 453 - 463 Washington Street in the early 1890s. Instruments labeled with a 694 - 700 Washington Street or 453 - 463 Washington Street address (sometimes in conjunction with the 33 Court Street address) date from 1889 or later. No drums were manufactured under the John C. Haynes & Co. brand name after 1903. As of January 1st, 1904 John C. Haynes & Co. was absorbed into the Oliver Ditson Company with John C. Haynes remaining as president of the Oliver Ditson Company as he had been since 1888. John C. Haynes died in 1907 after which Charles H. Ditson became president of the Oliver Ditson Company. 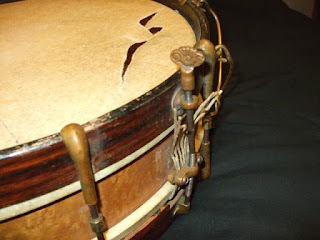 The vast majority of drums produced under the John C. Haynes name were rope tension drums in large sizes intended for street use or military purposes. 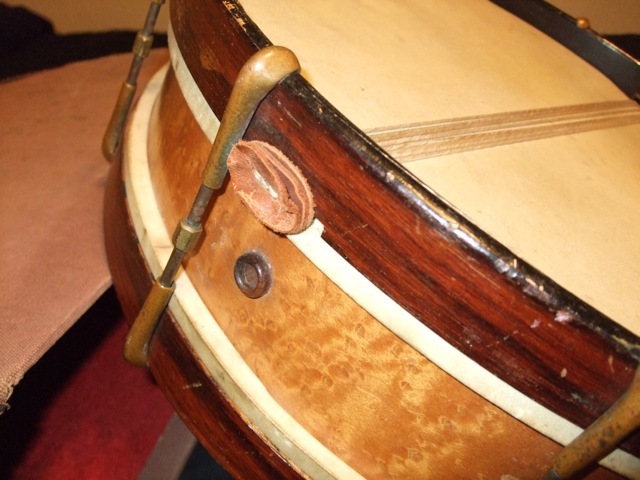 Shells were typically one-ply with reinforcing rings and a single air vent lined with a rosewood or ebony grommet. 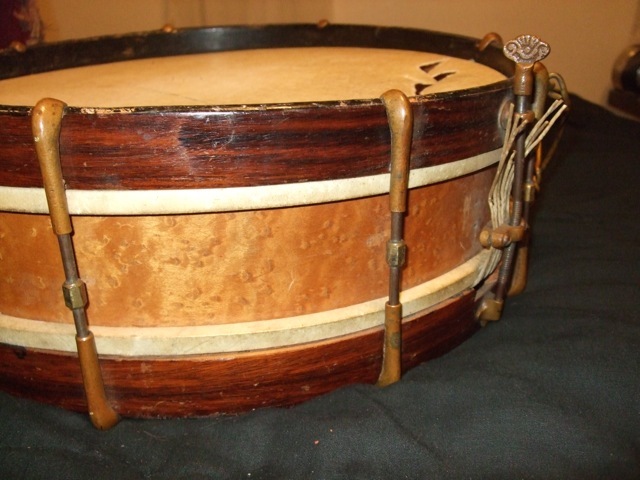 Shells and hoops were produced in a variety of hard woods including walnut, pictured above. Rod tension drums by Haynes are not common but did begin to appear by the late 1800s. 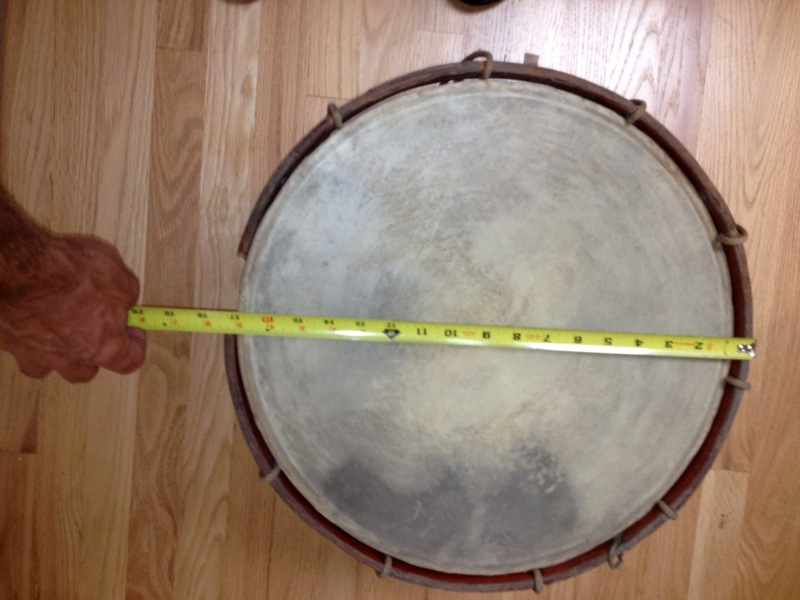 The drum pictured here features a label listing both the 33 Court Street address along with 453 - 463 Washington Street. 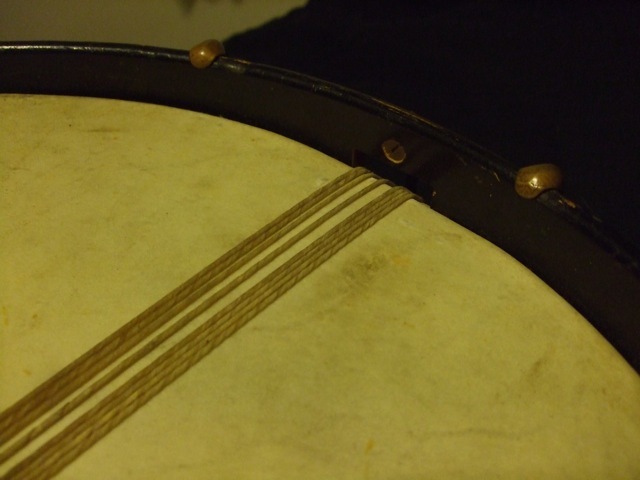 It is also unusual in that it accommodates two sets of eight gut snares which run side by side along the bottom head. I signed up through Google, but can't for the life of me figure out how to post anything on the google "field drums" blog website. 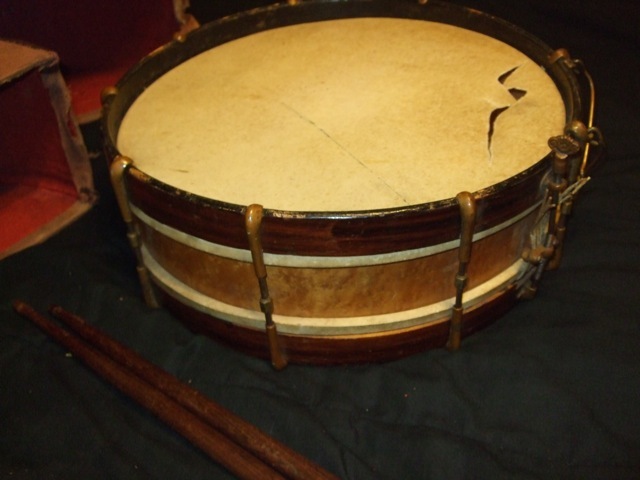 I am interested in more info about my 1890s marching snare. I am moving and need to sell it, but have no idea what to put it on Ebay for, or how best to sell it. Most my auctions are $ .99 with no reserve, but I'm sure this is worth something. PS I am a lifelong performing and recording musician, main intrument is keyboards. This from one of our readers, Ron E. Skoog of Phoenix, AZ. I found your addresses from a web article from 2009 on two Lyon and Healy field drums donated to the Music Instrument Museum here in Phoenix where I live. I'm a life-long percussionist and recently received this L&H snare drum that was my great uncle's. 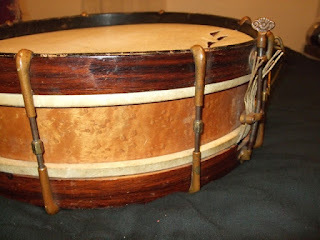 I'm interested in learning more about L&H and this drum in particular... wood species, etc. I'm also considering whether to restore it for beauty sake or just leaving it purely original albeit quite used/abused. I've researched enough to know that different L&H badges show different addresses as well as logos. This badge on the inside looks like the badge from the field drum given to MIM with the script logo and blackened scrollwork. Warerooms, Wabash Ave. and Adams St. There is no badge on the outside of the shell. If either of you would have the time to share your knowledge with me I'd appreciate . Referrals are great as well. Google "Lyon Healy field drums".